Imagine a speaker delivering a message so powerful and so compelling that in an hour or two he has almost magically transformed the lives of an audience forever. Imagine an individual who has committed his life to breaking down barriers of fear by captivating audiences with his dynamic story and truly heartfelt insights. Imagine a speech combined with an athletic performance that is guaranteed to thrill everyone. Imagine being inspired to take action by a speaker long after his presentation. More than an assembly program, a real lesson in overcoming obstacles and working to achieve your goals. If your school is seeking to motivate and engage your student body, Mike Simmel will do exactly that! 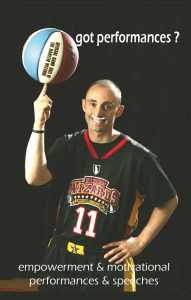 Many communities have booked Mike for a full day going from 3 to 4 schools to promote his message. But a single assembly program can not only motivate your school community, it will teach very valuable life lessons in respect and overcoming life’s obstacles. “Mighty Mike” Simmel has been on a roller coaster ride in life and he will take you and your audience on a journey through the ups and downs of living his dreams despite his many obstacles of being an adult having and thriving through a disability. 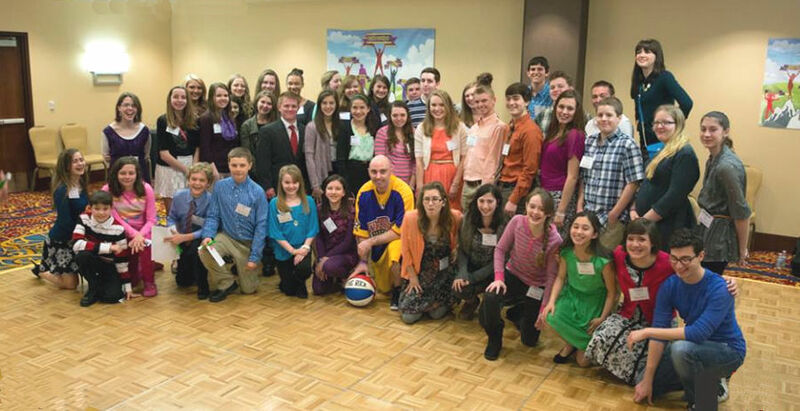 Your audience will be amazed when they learn that Mike is a person living with epilepsy. They will learn that “being different is being great”. As a young child, they will also learn that Mike could not skip or hop on one leg, had to wear a helmet and was debilitated to special-ed gym class. 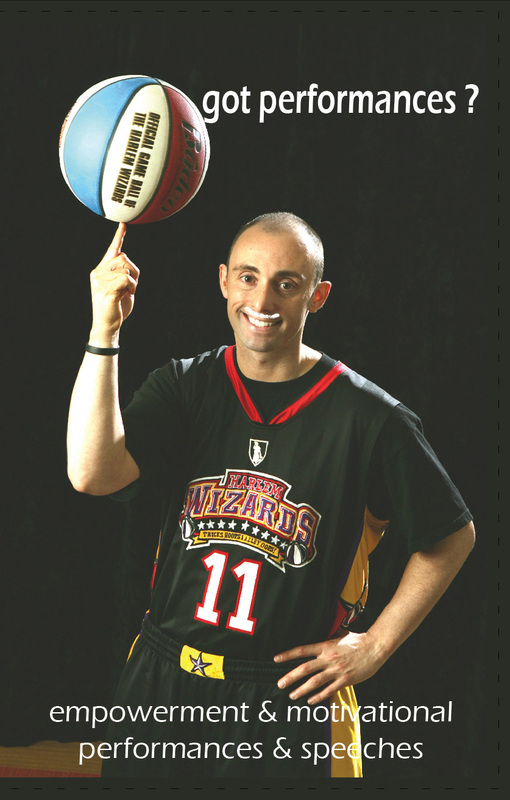 Now he performs dazzling multi-basketball handling tricks that made him a successful player on the circuit for the Harlem Wizards basketball team for 13 years and at many high profile events! The Mighty Mike message is that “everyone has an inner talent and we must find that talent, maximize it to its fullest potential and make a positive impact on the world.” Mike’s message will show how to lead and persevere through adversity. He will show each and every child how to reach their dreams and overcome adversity in their individual everyday lives! He has taken the “dis” out of disability and made it into an “ability” to help others in life with his Bounce Out the Stigma Project…Each child will learn how they too can have the “ability” deep down and become a better leader, overcome adversity, and find the heart of a champion. The program will condense an interactive basketball show with the themes of goal setting, anti-bullying, confidence building, healthy living and disability awareness. They will also believe that self-belief and determination can turn debilitating effects of failure into success. The lessons will show each child that no matter what adversity they may face they can use that as a positive outlet and reach toward a better tomorrow. Mike’s teaching will combine both the substance and style that has made him very successful speaking at events for the Epilepsy Foundation of America (and its statewide affiliates), Special Olympics, Boys Scouts of America, many Church Organizations, Youth Centers, National Pharmaceutical Companies, hundreds of school programs and at many of the top colleges on the summer basketball camp circuit. Everyone will feel motivated with the purpose to accomplish something positive in and out of the classroom. If your audience loves music, fun, sports and high energy, this is definitely the program for you! If you want to learn the secret how “Mighty Mike Bounces Back” bring Mike to your school today! “Mighty Mike you showed my class how important working hard is”. Contact Mighty Mike Basketball for further Information on how to bring this program to your school or community.